The Amazon Echo Spot looks like the brand's best smart home, voice-controlled thing to date. With the Echo Spot's arrival, in a choice of white or black, the Amazon Echo family continues to grow at a rapid pace, like the family that lives on the end of your street. However, unlike them, the Echo family is not always getting up to no good, and probably does recycle correctly. Able to draw on Amazon AI Alexa's 10s of thousands of 'skills' (apps), the Echo Spot looks very much like the best Echo to date. 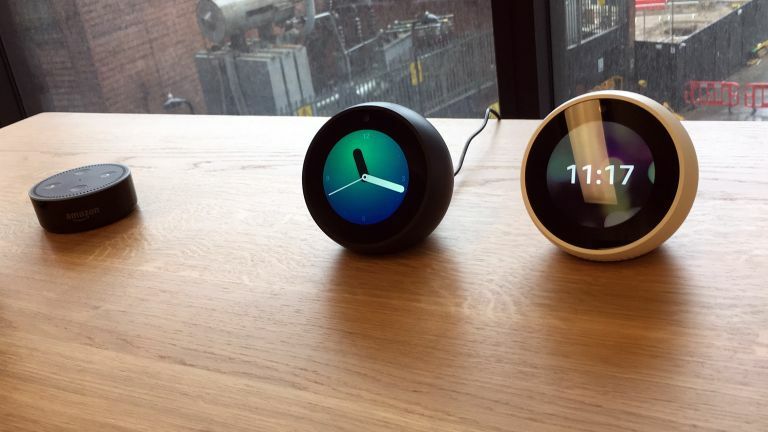 The Echo Spot can be thought of as an Echo Dot (the scaled down version of the original Echo) but with a camera and screen. It is to the Echo Show what the Dot is to the larger, cylindrical versions of the Alexa-containing smart device. The size makes it easier to place than the Show, although admittedly this means that any video shown on its screen naturally wants to be round. You can crop images to standard, rectangular widescreen but, of course, what results is rather on the small side, though perfectly viewable from up to a few metres away. As well as the physical, 3.5mm audio connector you can connect Spot to a speaker via Bluetooth. Yasssss! The Spot also matches the Dot in that, as well as being able to connect to a wireless speaker via Bluetooth – a feature that Amazon slipped out last year under cover of darkness, without telling anyone – there's also a 3.5mm audio output so you can also physically connect to a better speaker. It's not as fancy, but Bluetooth or a length of cable is a better audio solution for most people than the multi-room, bells-'n'-whistles Chromecast, as used by Google Home. The Amazon Music, Prime Music and Spotify music services can then be voice controlled, with quite sophisticated search phrases available on the Amazon services, such as "Play sad 1970s music" or "upbeat 80s heavy metal" or "that song that goes [insert popular lyric here]". In every other way Spot seems identical to Show, but smaller and ballsier. It has graphics added to core skills such as weather, news, timers and sport, the ability to make video calls and 'drop in' on other Show or Spot users. That's potentially handy for everything from contacting the planet Earth with your kids' room, checking on an elderly relative, voyeurism, and making sure your hostages haven't escaped. The screen is impressively clear, even at quite oblique viewing angles, and the circular video is absolutely fine for news and calls, even if you aren't going to want to watch Dr Zhivago or Guardians of the Galaxy 2 on it. All existing skills with a visual element will, I am assured, work with Spot's new, 'roundscreen' aspect ratio. Due to the smaller size and different shape, there are only 4 mics in the Spot but it doesn't appear to make any difference. Alexa can still hear and understand you most of the time. I get the feeling that you will tend to use Spot from a shorter distance away – on a bedside table or kitchen worktop – but Amazon reckons that "enhanced noise cancellation" will help it hear you from a distance as well, anyway. We're getting a review sample this week, hopefully. As ever, smart home control is a key feature, and one of the ways Echo beats Google Home, at least for now. Brands supported now include "Ring, Arlo, Philips Hue, IKEA, Hive, TP-Link, Netatmo, WeMo, Smart Things, and Tado." Whether you use it as an intercom, smart home hub, alarm clock or audio system controller, the Amazon Echo Spot is a very cool little thing indeed. • Echo Spot is available for pre-order today, in black or white, and will start shipping on January 24. Pricing: £119.99 or £199.99 for a pack of two.